Home Companies Shanghai GTO Machinery Co., Ltd.
Transported medium allowed: clean water or other liquids with similar physical and chemical properties to clean water. Other liquid, please contact our company for information. 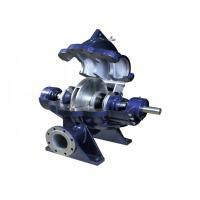 The pumps are widely used in city water supply and drain-off, water supply for cities and towns; water supply and drain-off for central heating system; water supply and drain-off for steel plant and metallurgical industry enterprises, oil refinery for petrochemistry, paper mill, oil field, heat and power plant, airport construction, chemical fiber factory, textile factory, sugar factory, chemicals factory and power station; water supply for fire-fighting system for factories or mines, water supply for air conditioning system; farmland flood-drain and irrigation and various water conservancies. * Maximum operation pressure (inlet pressure+ pressure transferred by pump): 1.0Mpa (Hsp≦75m) or 1.6Mpa (Hsp>75m), special disposition can reach 1.6Mpa or 2.5Mpa. * Transported medium allowed: clean water or other liquids with similar physical and chemical properties to clean water. Other liquid, please contact our company for information.